Convert each letter to its numerical value, and read each pair of values as 2 digit numbers. In each row, the number in the centre equals the difference between the 2 digit values on the left and right. 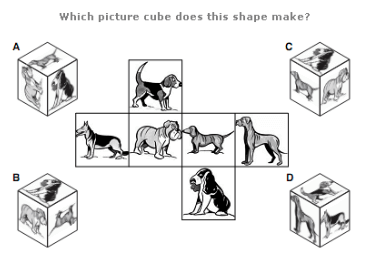 Start in the top left hand corner and move anti clockwise around the perimeter of the square. 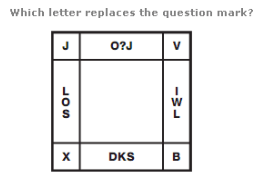 Letters are written in alphabetical order, skipping 1 letter, then 2 letters, then 3 etc. 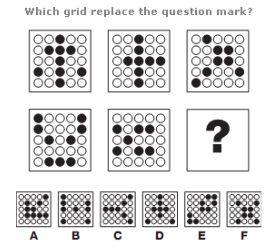 In each row, the left hand grid is symmetrical around a vertical axis, the central grid is symmetrical about a horizontal axis, and the right hand grid is symmetrical about a diagonal axis, running bottom left to top right. 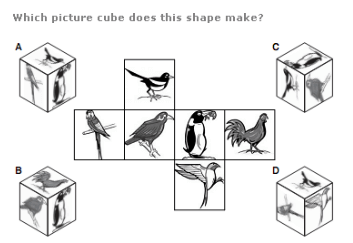 More educational and fun tests below. Questions or comments? Please discuss below. Join and become an insider! Get valuable articles straight in your email. 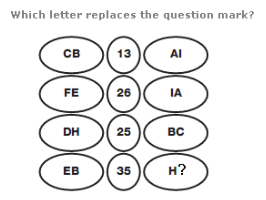 puzzles, general knowledge test questions and GMAT test advice and questions. No login required. All tests are free. All the tests you need when you need them.